Kraftwerk are a band trapped in the vast frame of their apparent influence. Aptly for a group so fascinated by travel they enjoy an image as the ultimate electronic pioneers — “the reason music sounds like it does today,” as one BBC documentary put it. Let’s take for granted then that it’s impossible to imagine modern pop music without Kraftwerk and try a more interesting thought experiment: Let’s try to imagine Kraftwerk without modern pop. What if they’d released the same body of work and influenced nobody? Would it still sound as good? 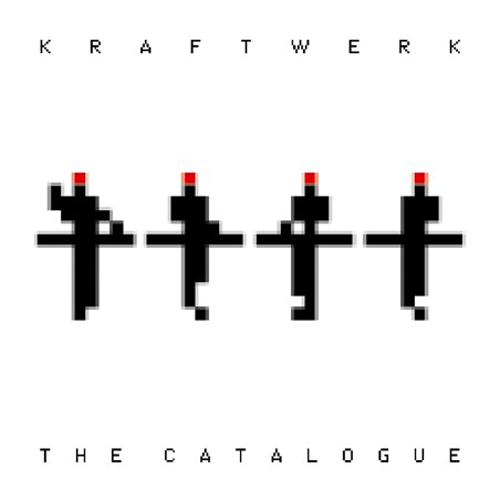 This box set is an opportunity to find out– a remastered, sealed-off package of what Kraftwerk (or at least remaining founder Ralf Hutter) would like you to consider its canon. This starts with 1974’s Autobahn. The three albums Kraftwerk made before are beloved of many fans, but the group routinely ignore them as inconvenient prologues charting the band’s messy discovery of electronics. The Catalogue skips past these to give you a run of five consecutive masterpieces, two albums whose flaws are at least intriguing, and then 2003’s very fine Tour de France. Most of these remasters are available as separate issues (due to licensing issues three of them aren’t in the U.S.), but the box as a whole is as full a Kraftwerk story as you’re likely to be officially offered. As such it invites you to consider their achievements and development in relation to themselves, not to wider history. A review of the new box set of 8 of Kraftwerk’s proto-techno pop classics, all remastered by Ralf Hutter himself. There are some mixed reviews on this reissue series, partly due to the mixes themselves, but also 2 of the albums being renamed and with different covers than on some of the originals. The first time I heard Kraftwerk it was like a scorch of hot metal, a bolt of white light to the mind. I was 16, an indie girl from an industrial town, an unlikely target for machine music made by four men from Düsseldorf. Chris, my best friend and partner-in-crime in small-town escapism, had come round as usual on a damp Friday night, with four cans of Fosters that would go straight to our heads, and some dusty CDs he had bought with his pocket money. Usually we’d listen to Teenage Fanclub, Blur, or some dull, cut-price grunge, but this album looked different. An indigo-blue and luminous yellow cover; a monochrome robot with wild, widening eyes; a title, The Mix, set in Ceefax-style building blocks. I was scared of it, somehow, genuinely puzzled by its strangeness. And then its first track whirred, sputtered, shot into life, filling the corners of my mum’s old front room – a dark hole full of bibles and commemorative plates to old collieries – with something bright, clear, and incredibly modern. It sharpened the room’s old-fashioned edges; it set my synapses alight. And slowly but surely, Kraftwerk became mine. Another video by the band led by Karl Bartos, former Kraftwerk member. From their debut album Esperanto. Second half of this press kit by Yamo, led by former Kraftwerk member Wolfgang Flur. Another track from Tone Float by Organisation, the band that soon became Kraftwerk. Later on, it was re-released under the band name Kraftwerk – Organisation (presumably to sell more records). But even though this band included Hutter and Schneider, this is before Kraftwerk. Later on, they denounced this album and the first few Kraftwerk albums. Considering that their sound and style changed so radically, it’s not hard to understand. But this was interesting stuff. Yamo was created by Wolfgang Flur, who was originally in Kraftwerk and who left in the late 1980s.